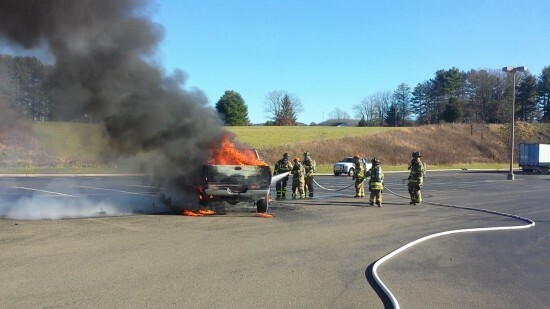 On Wednesday, December 16, 2015, at 1:41pm, the Galax Fire Department was dispatched to Lowe’s on Carrollton Pike for a vehicle fire. Upon arrival, units reported a fully involved pickup truck in the corner of the parking lot towards Grayson National Bank (8351 Carrollton Pike). The driver was in the drive-thru of the bank, when she noticed smoke coming from under the dash. She very wisely pulled the truck into the open parking lot. This action definitely saved damage to the bank. Firefighters pulled one attack line to extinguish the blaze. The 2002 Dodge Ram 2500 pickup was a total loss. No injuries were reported. Pipers Gap Rescue Squad assisted at the scene. All Galax Fire units were back at the station by 2:30pm.